After you’ve created organized lesson plans, you still haven’t accomplished anything concrete yet. Everyone will evaluate you based on how well you teach the material in the classroom, not on how neatly you wrote your lesson plans or how much time you spent preparing them. Certainly, the more prepared you are, the better the odds that the resulting class will go smoothly, but that’s not a guarantee. Even the greatest stars in Hollywood are judged based on the quality of their last performance, and so will you. Meryl Streep never won an Academy Awards for learning her lines in record time — nobody really cares about that, even though it’s important to her overall performance. What matters is what happens when the film starts rolling, the curtain goes up, and that final late bell sounds in your classroom. You’re on! You’re an entertainer and a showman, and students’ opinions of you will be based more on how you teach than what you teach. Students would much rather be engaged in class and be interested in what you’re saying than be bored to death during the most informative lecture ever delivered. Pay close attention to your delivery to make sure that it heightens the value of your class notes instead of seriously detracting from your performance. Whether you’re lecturing, monitoring group work, or proctoring a quiz or test, you should move around the room throughout the period. You don’t have to be moving constantly, but don’t stand up there or lurk behind your desk all period long. If you get too stationary, students will figure out your routine and use it against you. If they don’t expect you to ever walk the rows of class during a test, they may get brave enough to “accidentally” leave a page full of notes on their lap during an exam. Besides, if you never come out from behind your desk, how are you ever going to bond with your students? Your desk is an emotional, as well as a physical, barrier between you and your kids, and you have to breach that barrier to establish a relationship with students. Some days, when your feet are tired, you could even sit at an empty student desk and teach for a while from there. It’ll make you more like “one of them,” and your students will appreciate it. Instead of toting them around, leave your notes on your desk, open to the page you’re teaching. If you need to quickly check them, stroll past your desk and consult as necessary. However, after you have your train of thought back on the tracks, move around the room again. Eye contact is the only way to truly gauge whether your students are understanding you at all. Because students are usually so hesitant to ask questions, you need to constantly monitor their faces to look for frowns and confused stares that tell you to explain yourself better. Students feel neglected when you don’t make eye contact with them. However, they think it’s hilarious when you try to fake eye contact. Every school has one teacher who is physically unable to establish eye contact with students. This teacher will keep his eyes fixed at some indiscriminate point on the back wall of the classroom at all times as he addresses his students. This point of attention usually floats just above the heads of the all the kids in the class, so no one is ever sure who he’s talking to. Students make fun of him mercilessly because, in their book, anyone who can’t make eye contact with them can’t be trusted. You can’t possibly be an effective teacher if your eyes aren’t constantly darting around the room, trying to sense trouble, drawing students into your class, and demonstrating that you’re on full alert at all times. As you talk, catch and hold eye contact with individual students for between two and three seconds and then move on. Don’t stare at a kid, or she’ll begin to get uncomfortable. Also, try not to always look at the same student or students, even if you like them better than the rest of your class. Visually engage everyone in the room each day at least once. Nothing makes you fair game for harassment faster than a distinct verbal crutch, you know? Listen to your speech patterns and edit out anything you say repeatedly — noises like “uh,” words such as “Okay,” or phrases like “Got it?” or “Isn’t that easy?” You may possess an amazing measure of intelligence and expertise in your field, but because of a repeated, guttural noise or catch phrase, your students won’t hear a word you say. Speaking to your students is just like holding any other conversation — there will be natural lulls and pauses in the dialogue. Don’t try to fill these pauses with awkward and repetitive verbal crutch words; just allow those moments of silence to pass unspoiled. These tiny intermissions give students a chance to catch up to you in their note-taking, to file away what you’re saying into their brains, and to mull over the lesson, all very important things. Too many teachers stand right in front of whatever they’re writing on the chalkboard, and the entire class has to wait until the teacher moves to see what’s going on. This causes class to move slowly, because students are always a couple steps behind you. Stand as close as you can to the chalkboard, with your body parallel to the writing surface. Write with your arm stretched away from you, so there is space between your body and your notes. 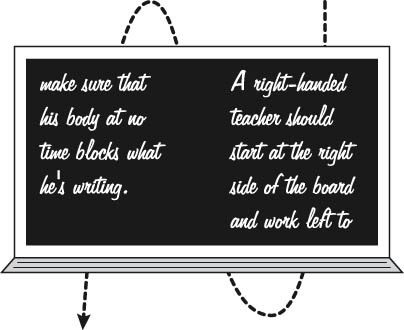 If you’re right-handed, begin at the right side of the chalkboard and work your way left so that your body at no time blocks the contents of the board (as shown in Figure 1). If you’re left-handed, do the opposite: Start at the left side of the board and work right. Figure 1: How a right-handed teacher should work the chalkboard. Lefties do it the opposite way.